MANILA, Philippines – (Updated June 10) The Professional Regulation Commission (PRC) on Wednesday, May 23, officially released the results of March 2018 Licensure examination for Teachers (LET) or teachers board exam. The schedule and venue of registration, oathtaking schedule as well as verification of ratings page are available on this page as announced online. 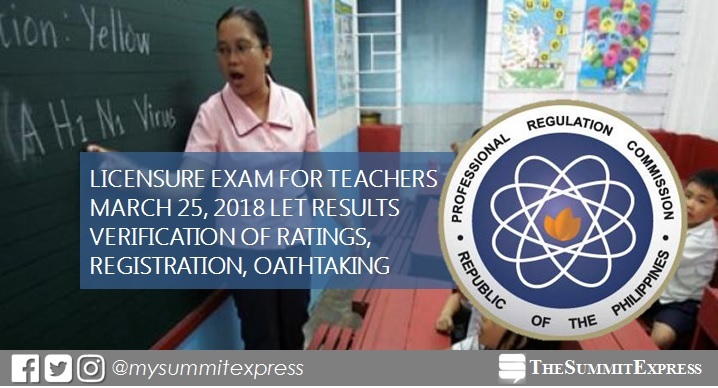 PRC announced that 13,774 elementary teachers out of 58,323 examinees (23.62%) and 22,936 secondary teachers out of 76,673 examinees (29.91%) successfully passed the Licensure Examination for Teachers (L.E.T.). View the complete results of March 2018 LET here. Successful examinees should PERSONALLY register and sign in the Roster of Registered Professionals, PRC emphasized. In addition to Initial Registration, the PRC-NCR will also accommodate requests for the following certificates: Report of Rating, Certificate of Passing and Certificate of Good Standing, upon the request of the successful examinee. These additional services is offered to enable the public secure necessary certifications/ documents through a onetime visit, maximizing their time and the Commission being of better service to the Filipino professionals. The requested certificates will be issued/released together with the Professional Identification Card (PIC) and Certificate of Registration after the oath taking ceremony of the Initial Registrants. The Summit Express together with our partner website, PRC Board News will consolidate on this page all announcements from PRC regarding oathtaking schedule and venue. It will be updated here once available online. The PRC online verification of ratings (VoR) page for March 2018 Licensure examination for teachers (LET) is now available online or seven (7) working days after the release of results. On the official website of PRC, select Verification of Rating under Other eServices section.